Whilst Alexor uses a number of methodologies and products, its approach is always highly tailored to reflect the particular needs and circumstances of individual clients. Clients define the scope of their requirements, buying into as much or as little of the total service as they require. 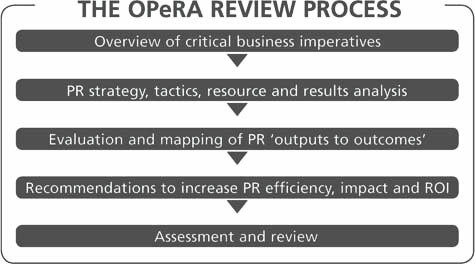 At the heart of all our work lies the OPeRA review process which incorporates quantitative and qualitative research and Communications audits, where necessary, to establish where efficiencies can be achieved in a PR strategy or programme. The proprietary OPeRA methodology combines classic management consultancy principles with independent PR experience and expertise in a seamless process.